Once upon a time a priest lived in a small village. He used to do prayers at the village people homes during special occasions. One day, one of the families in the village offered the priest a goat for the pooja he performed in their new home. The priest was very happy about the gift. He carried the goat in his shoulder and walked towards his home. 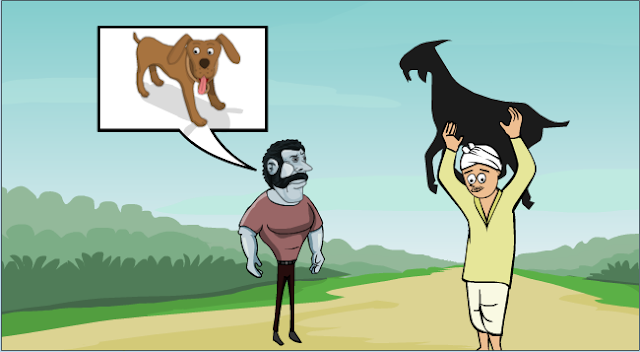 Three bad crooks in that village saw the priest carrying the goat. They wanted to steal the goat from the priest. So they put a plan to take the goat from the priest. According to their plan, the first thief went to the priest and said, "Are you crazy? Why are you carrying a dirty dog on your shoulders" The priest was shocked to hear this. He said to the man, "Are you blind? this is a goat and not a dog". The thief said, "you should be blind. This is a dog. Go and check with someone in the village." Saying this the first man went on his way. The priest walked further, then the second crook according to their plan came on the priest way and asked, "Dear Priest, why are you carrying a dead calf on your shoulder?". 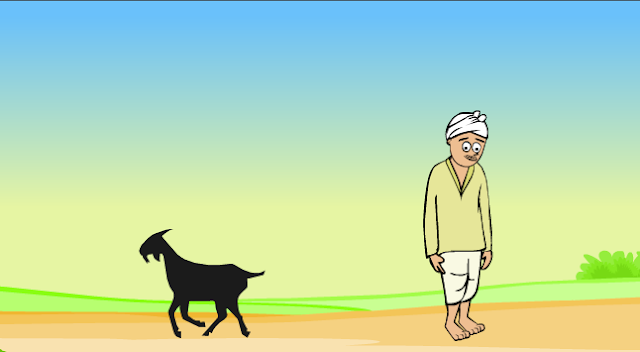 Again the priest tried to explain that it was a goat but the thief acted as if he couldn't believe that it was a goat. This time the priest was a little confused. The priest started to walk further, this time the third thief came in front of him and asked, "Hello man, why are you carrying a donkey on your shoulders?" The priest told him that it was a goat, but again the man acted as if the priest was carrying a donkey. After the third thief left, the priest was totally confused. He thought to himself, "This should be some bad monster. That is why this is changing its form everytime." So he threw the goat on the ground and ran to his house. The three thieves then took the goat and went to their home, laughing at the foolishness of the priest. MORAL: Always think well before trusting the words of bad people.